My blood pressure has been tested, my pulse rate recorded and the skin temperature of my left arm noted. I’ve been quizzed about my sleeping habits and have reluctantly drawn a face to show how I feel (a squiggly mouth reflects my bewilderment). This may sound like an exhaustive medical examination (face doodles aside). Yet I’m not being quizzed by a conventional doctor, nor am I sitting in a hospital. Instead, I am preparing to take part in an unusual – and increasingly popular – Japanese pastime that promises complete mental and physical rejuvenation: “forest bathing”. More precisely, my health is being checked by a “forest therapist” before she guides me along an ancient pilgrim route in southern Japan – during which I will stretch, meditate, be told to b-r-e-a-t-h-e, inhale tree aromas, eat healthy food, appreciate pretty flowers and generally be submerged in all things forest. Japan and forests have long gone together as smoothly as sushi and sake. With vast expanses of the archipelago swathed in mountains – plus the predominant Shinto religion rooted in nature worship – it’s perhaps little surprise that forests hold a special place in the national psyche. 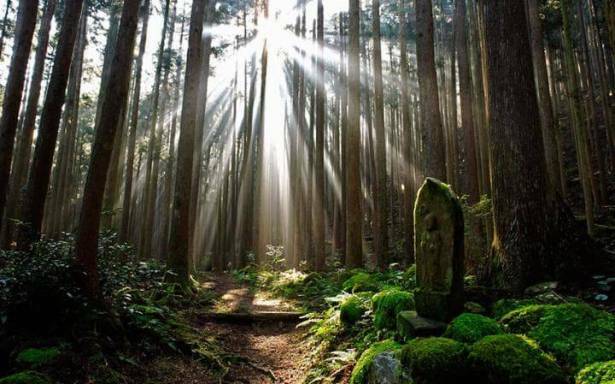 It was in the Eighties that the phrase “forest bathing” (shinrin-yoku) was poetically coined by government officials at the Forest Agency of Japan. Its goal? To encourage healthier lifestyles by taking regular walks in specially designated forests. As a working mother of two living in central Tokyo – with a to-do list taller than a tree and a daily juggling act that frequently veers into freestyle chaos – a health reboot would not go amiss. It’s probably not ideal that my default stress-coping mechanism is to eat my body’s weight in chocolate and the most relaxing part of my day is cooking the kids’ dinner while simultaneously sending emails, running the bath and singing along to Moana with my two-year-old. Alarmingly similar to a salaryman, I tick all the overworked urban boxes – not enough sleep (check), not enough technology-free time (check) and definitely not enough hours in the day (check). It’s not just romantic notions of birdsong and forest smells that seduce me: it’s the fact that forest bathing is scientifically proven to improve health. According to countless Japanese studies, it boosts immune systems, reduces stress hormones, enhances mental wellness, bolsters brain health. One report even claims it lowers blood glucose levels among diabetes sufferers. Suitably sold, I head to the remote forested Kii Peninsula in Wakayama prefecture to walk part of the Kumano Kodo, a network of Unesco-protected pilgrim routes dating back thousands of years. The starting point is the Kumano Hongu Heritage Centre – a contemporary wooden structure in a lush green valley surrounded by mountains – also known as the region’s “forest bathing” HQ. We start near a small shrine where I copy Yasuyo-san washing her hands in spring water, tossing a coin and clapping her hands in prayer before she leads me through some yoga-like standing stretches and breathing. Then, we set off – and are soon enveloped in forest. Venturing along a narrow pathway, we are surrounded by dense lines of tall, straight and skinny Japanese cypress and cedar trees. As we walk, I wonder when – and how – I’ll experience my health reboot. My brooding, however, is interrupted by regular exclamations from Yasuyo-san as she waves her hands in white fingerless gloves. “Look, baby sugi cedar tree!”, “Pretty white flower!” and “Leaf as soft as a baby face!” are typical highlights, interspersed with borderline militant orders such as “Jacket off!”, “Sip some water!” and “Take a photo from here!”. Soon, I hear “Stop!” – and I see around 40 “log beds” scattered among the trees, fashioned from neatly tilted clutches of chopped trunks – the setting for our “log meditation”. A pink polka dot plastic sheet is ceremoniously placed on a bed, before I’m instructed to lie down, inhale deeply and close my eyes. Surprisingly comfortable, I almost drift to sleep when music unexpectedly fills the air: I open my left eye a fraction and spy my forest teacher swaying among the trees as she plays a melancholy tune on a bamboo flute. The overall effect is surreal but calming – so much so that I’m reluctant to stand up when instructed to move on around 15 minutes later. We continue walking and the forest tableau shifts as the path rises, giving way to hillside farmhouses, fruit trees and vibrant green tea fields. At one point, I indulge in some shopping, Kumano Kodo style: an empty path-side shelter, with a single wall, a flap of fabric and a shelf with orange biwa fruits and green tea. I pop a 100-yen coin into a tin for some fruit (delicious and sweet) and we continue until we reach a wooden building, where Yasuyo-san produces lunch: a bamboo leaf bento box containing a colourful medley of rice and local vegetables (total calorie count: a precise 700). After a coffee made with hot spring water (a soft, mellow taste), I lose track of time as we continue through sun-dappled forests, stopping for stretches and to gaze at flowers. At steep points, we march for 40-second bursts, before stopping and breathing in deeply while circling our arms, in order to conserve energy. That night at an old riverside inn, I am unsure as to whether I am healthier, although I sleep deeply, following a hot spring soak and a bowl of detoxifying black charcoal udon noodles. The next morning, I meet two ladies who dispel any lingering scepticism. Piling baskets of cedar leaves into a giant steamer in a small workshop on the Kumano Kodo route, they make 100 per cent natural essential oils from surrounding trees. And – the bit that my rational brain loves most – they are collaborating with university scientists who have discovered that Kumamo Kodo cedar tree oils can counter the symptoms of Alzheimer’s disease. It’s enough to convince me – and armed with a bag of brain-boosting oils, I continue to my final destination: the luxury hotel Amanemu in neighbouring Mie Prefecture. As I head back to the frenzy of my Tokyo life, I honestly have no idea whether my blood pressure and skin temperature are different, or whether my immune system has been boosted. But I am, without a doubt, rested and relaxed – and if someone were to ask me to draw how I was feeling, I would happily opt for a smiley face.